Mask of the Madaras twins, denizens of the Forbidden Woods, likely belonging to the older of the two. The twins grew up in silent kinship with a poisonous snake. Eventually they learned human ways, and became hunters. When they discovered vermin even in their beloved snake, the younger brother is said to have murdered the older. Garb of the Madaras twins, denizens of the Forbidden Woods, likely belonging to the older of the two. Both the twins became hunters, and brought back and dissected their beast prey, in order to support the villagers in their forbidden research. Gloves of the Madaras twins, denizens of the Forbidden Woods, likely belonging to the older of the two. Both the twins became hunters, and brought back and dissected their beast prey, in order to support the villagers in their forbidden research. Trousers of the Madaras twins, denizens of the Forbidden Woods, likely belonging to the older of the two. Both the twins became hunters, and brought back and dissected their beast prey, in order to support the villagers in their forbidden research. 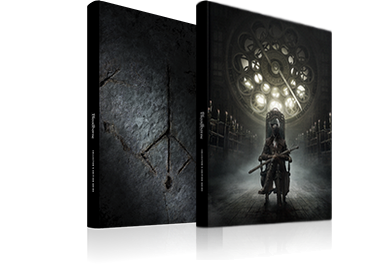 Butcher Set has one of the highest Thrust defense and the highest Rapid Poison resistance of armor sets. 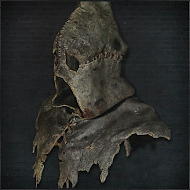 Butcher Mask has one of the highest Rapid Poison resistance of all head pieces. 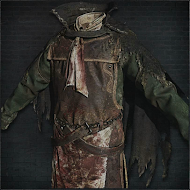 Butcher Garb has the highest Rapid Poison resistance of all chest pieces. 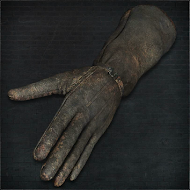 Butcher Gloves have one of the highest Physical, Thrust defense and Rapid Poison resistance of all Hand pieces. 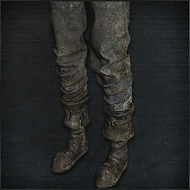 Butcher Trousers have one of the highest Thrust defense and the highest Rapid Poison resistance of all Leg pieces.